If houses and streets, neighbourhoods and cities could tell us their stories, what would these be? The present dominates our sense of space, but the past is always enduring under the surface, even when it has been socially, politically and economically concealed. 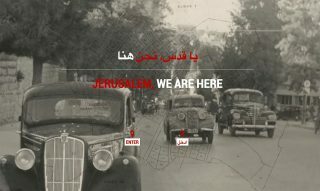 In this AHM Lecture Series Prof. Dorit Naaman will show her interactive documentary ‘Jerusalem, We Are Here’. The documentary digitally brings Palestinians back into the Jerusalem neighbourhoods from which they were expelled in 1948. Focusing primarily on the neighbourhood of Katamon, Palestinian participants probed their families’ past and engaged with the painful present. Together with her team, Prof. Naaman produced short, poetic videos, filled with nostalgia, sorrow, and fleeting returns. The films are embedded into a virtual tour where the audience can ‘walk’ donw the streets of Katamon as these were filmed in 2012-2015. As you meander down the streets of contemporary Jerusalem, the soundscape is from the 1940s; and when you reach the home of each participant, you can watch the video/audio produced. As the generation of Palestinians who survived the Nakba (the 1948 catastrophe) is aging and passing on, there is an urgent need to collect their stories and knowledge, and remap the space that has been declared entirely Israeli. Prof. Dorit Naaman is a film theorist and documentarist from Jerusalem, teaching Film and Media at Queen’s University, Canada. After finishing a BFA in Film and TV production from Tel-Aviv University, she continued her academic career with an MFA in art filmmaking at Syracuse University and a Ph.D. in film theory at the University of Alberta, Canada. At Queen’s she found a department especially supportive of merging theory and practice, and she soon merged her filmmaking background with her theoretical interests. Her research focuses on Israeli and to a lesser extend Palestinian cinemas. She studies nationalism, gender and militarism, and expanded her work to include photography and news media and is interested in identity politics, and the effects of global economy both on aesthetics, and on ideological formations. The lecture is open for all university staff, MA & PhD students as well as general public. This lecture series is organised by the Amsterdam School of Heritage, Memory and Material Culture (AHM) in cooperation with gate48 – critical Israelis in the Netherlands. Please register in advance via sanne.letschert@student.uva.nl.